It has been a long time coming, but finally AMT/Round 2 has reissued the old Man From U.N.C.L.E. car. 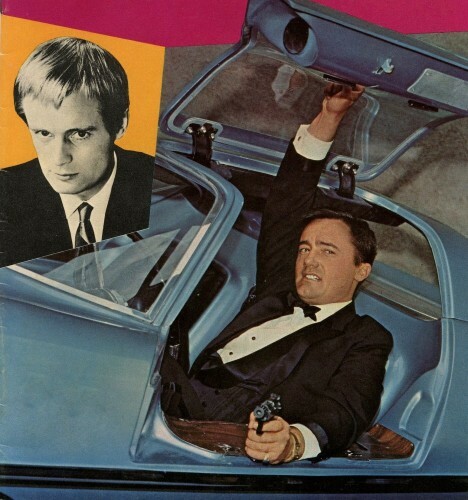 To save cost, AMT chose not to have the kit licensed through MGM, so the words U.N.C.L.E., nor photos from the TV program appear on the kit. 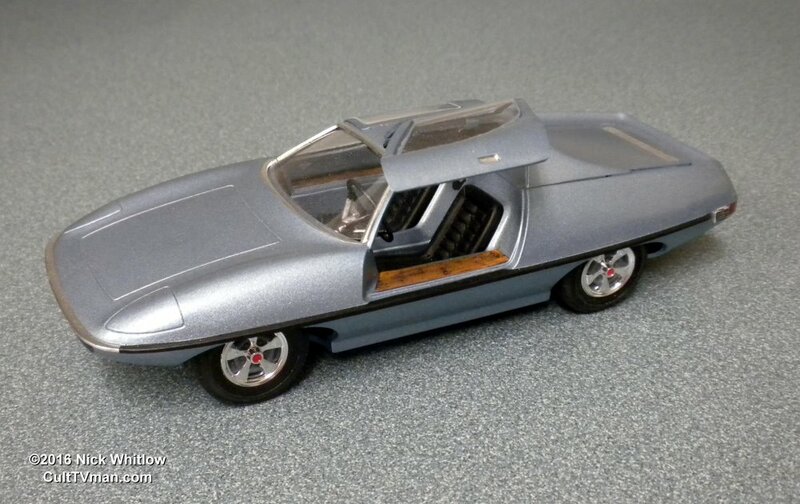 First issued in the late 60’s, the Spy Car is a very close representation of the original vehicle AMT hand-built for the TV Series under the supervision of the legendary Gene Winfield. However, there are some areas that the kit is lacking, so we will concentrate on those. 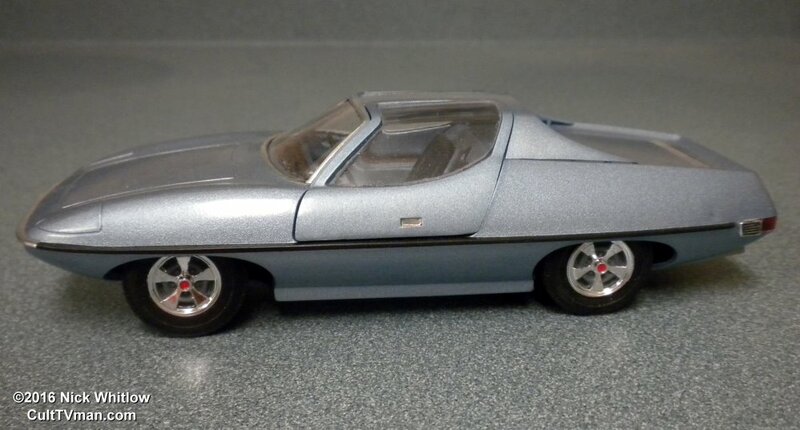 I built my Piranha to look street stock with none of the spy features exposed. That means no open smoke generator doors, no flamethrowers, and no gadgets showing in the interior. Door Hinges: The weakest part of the Piranha kit is the gullwing door hinges. 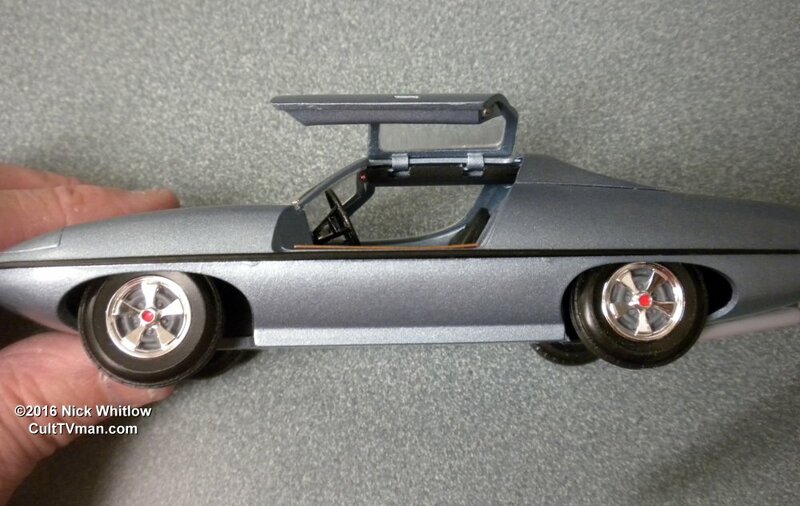 The doors actually fit nicely but the two small pins used to create the pivot action are easily broken and do not copy the actual hinges of the rear car. 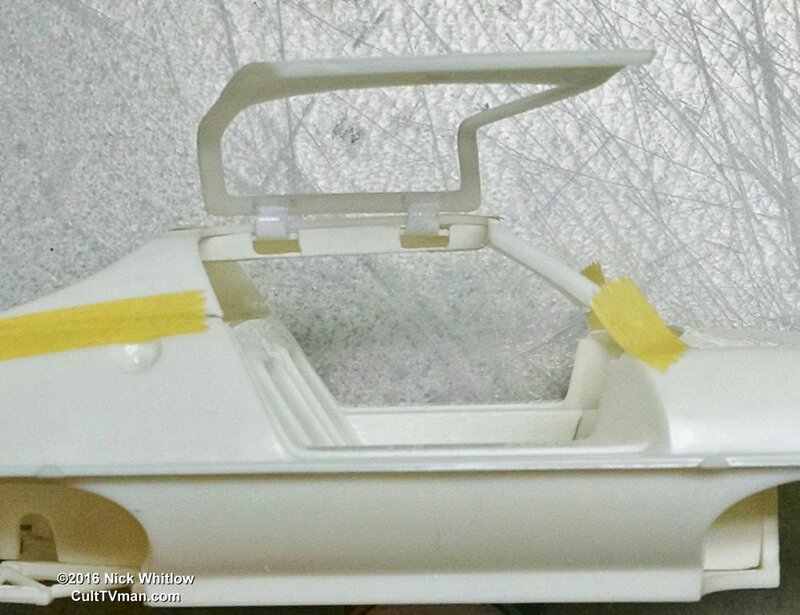 Below is a close-up photo of the hinges on the original UNCLE car. Note how they fit into the overhead console (laser beam unit) which is furnished in the AMT kit. To fabricate these, I took a piece of 5/32” Evergreen Plastic Tubing and cut a piece a little over ¼” long and cleaned up the ends. I then cut the piece in half lengthwise. At this point you can trim off the little hinge pins from the doors and clean up those areas with a file or sandpaper. I then used masking tape to hold the door to the roof in the closed position and marked the proposed locations for the hinges on the door. Don’t locate them too close to the ends because you will need some space for the hinge to operate inside the console. Next, I trimmed each piece of tubing into a “T” shape and test fitted them to the door and roof. One important thing that needs to be done before proceeding is to bevel the top edge of the door to the inside. The door will bind against the roof when opening if the door has not been beveled properly. Next, I applied a small amount of liquid glue to the hinge and to the door and positioned each hinge in the desired location. Do not get any glue on the roof or the seam between the door and roof. Give it plenty of time to cure. Next you can work on the upper console piece which will hold the hinges in place. 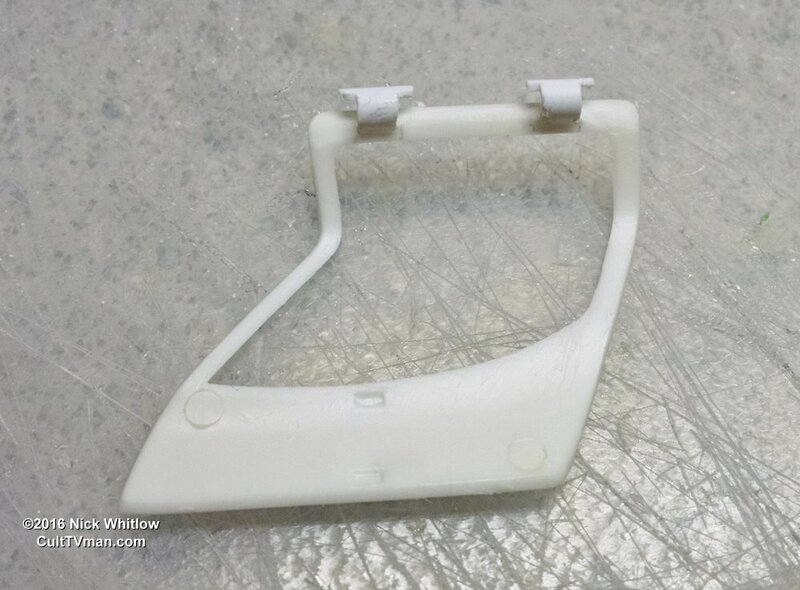 This part has two small stems at the back which hold the original hinge pins that we trimmed off the doors earlier. Cut off the stems and finish the spots but make sure to note which end goes to the front. The part is slightly curved to fit one way. After the hinges are solid, remove the door from the masking tape and reposition it back into the opening with the hinges at the edge of the opening. 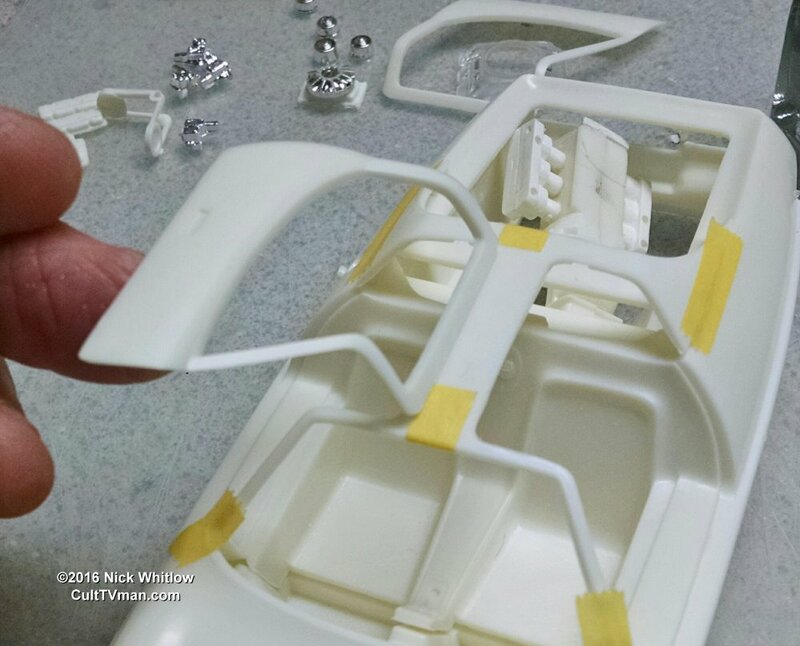 Place the console in its final position using the little tabs on it and the corresponding notches in the roof, and make two marks where the slots will need to be cut in the side of the console. Carefully cut them out and finish with a file. To test the action of the hinge, use a small strip of masking tape at each end of the console to hold it to the roof. At this time you can trim a little more off the hinge or the slots for a smoother hinge action. You may also need to trim a little from the inside of the upper console. Since paint will add a little bit of thickness to all the parts, you may want to trim a little extra to allow for it later. Don’t forget to add the Laser Beam lenses to the console before gluing it into position. Door glass: Another area that needs work is the location of the door glass. The kit windows glue nicely to the inside of the doors, but from the outside, they look set in too far. Fixing them will take very careful work, but the finished product will be worth it. If you have the Deluxe version of the Piranha kit, you can practice on the smoked glass first. Working from the outside, place the window glass in the opening and line up the top edge, back edge, and bottom edge of the glass with the window opening. Secure it in place with some small pieces of masking tape. You will see the front edge of the glass hangs over the door frame. Scribe a fine line on the glass where in will need to be trimmed, but be sure to scribe it outside the area so your line will be trimmed off. Remove the tape and carefully using a saw and file, trim away the excess clear plastic until the piece fits flush into the opening. 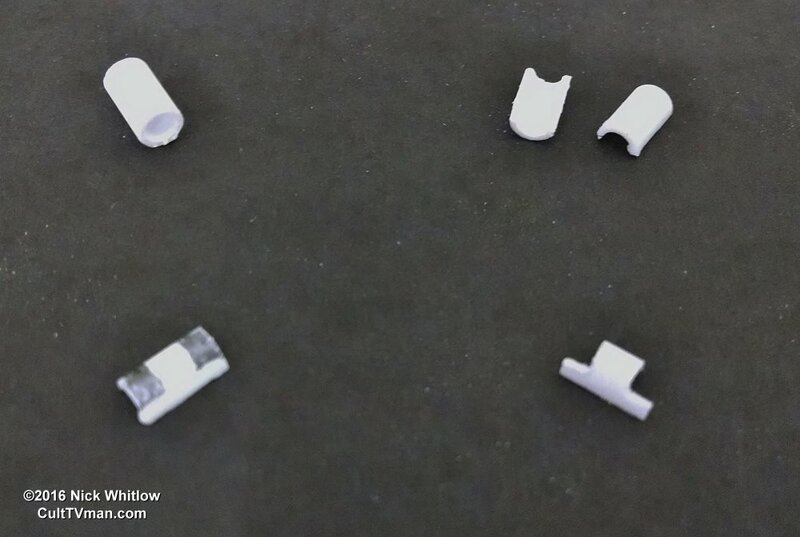 Once you are happy with the fit, glue it in place with Microscale Industries Micro Kristal Klear glue. Small gaps along the edges or corners can be filled in with additional drops of glue. The glue dries clear and the excess will wash away with water. 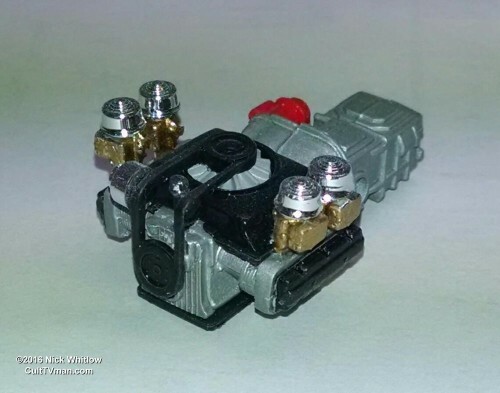 Engine: The Piranha kit engine has two turbochargers but the real car did not. It used a 140 cubic inch engine with four carburetors. Also, the kit engine shroud is the wrong size and shape, plus there is no pulley or belt to spin the engine fan. 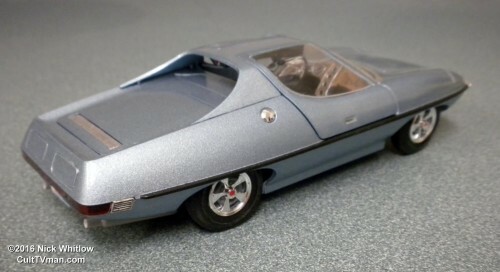 Therefore, I used the carbs, individual air cleaners, engine shroud, fan (which has a more accurate shape and size), fan belt & pulley, exhaust, and the lower cooling shrouds from a recent AMT Corvair kit. The actual UNCLE car used a stock exhaust, but had a switch to divert the exhaust to the side vents just in front of the taillight bar on both sides of the car. I omitted spark plug wires on this build to save time. Suspension: The suspension for the Piranha kit is difficult to assemble, especially in the rear. Even when built properly, the rear axle is almost too short to glue the wheels on to. You may want to lengthen the axle on both ends with plastic sprue or plastic tubing, or if you borrowed engine parts from a late model AMT Corvair kit, you can also use that rear axle. 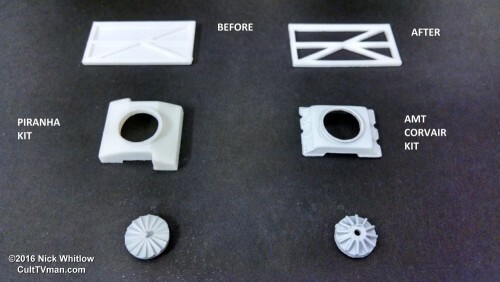 You will need to make the hole in the Piranha kit transmission larger or make the center of the axle smaller, plus make the holes bigger in the rear uprights and wheels. At least you will have more material to glue the wheels to. 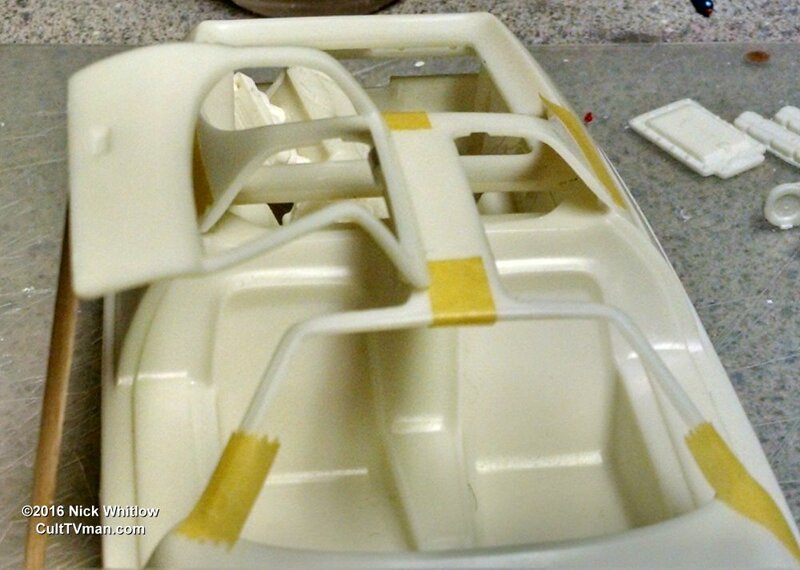 Windshield: Be sure to test fit the roof and windshield with the body before painting and final assembly. You may have to file the top and sides of the glass to make sure it will fit when it comes time to glue it in place. Use small strips of making tape to check the position and fit. You must glue the glass to the roof before gluing the roof & windshield to the body. Thank goodness for Micro Kristal Klear glue. 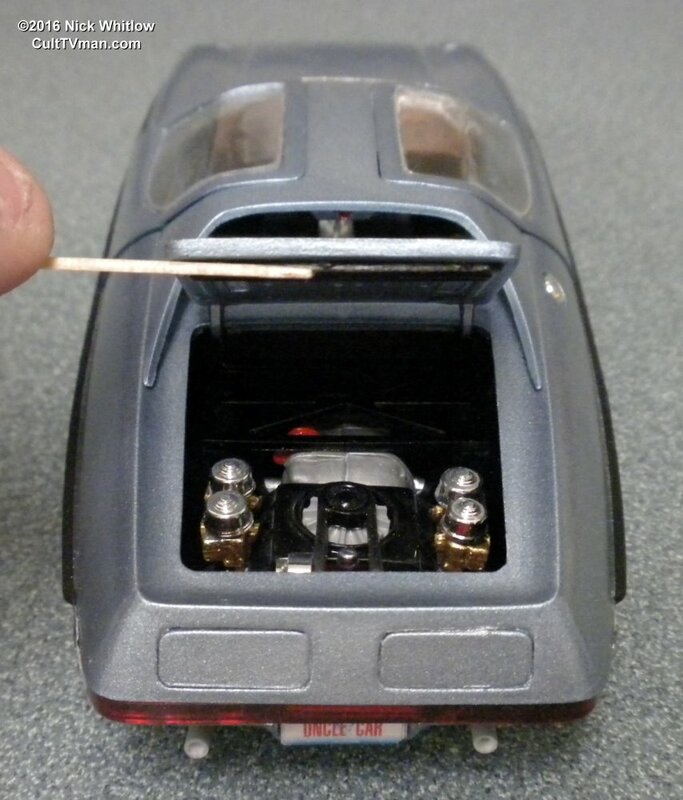 Super Detailing Tips: The piece in the engine compartment labeled Transmission Cover Panel is actually part of the rear suspension support and was constructed of square tubing. The recessed areas in the piece should be cut open. See the photo below. 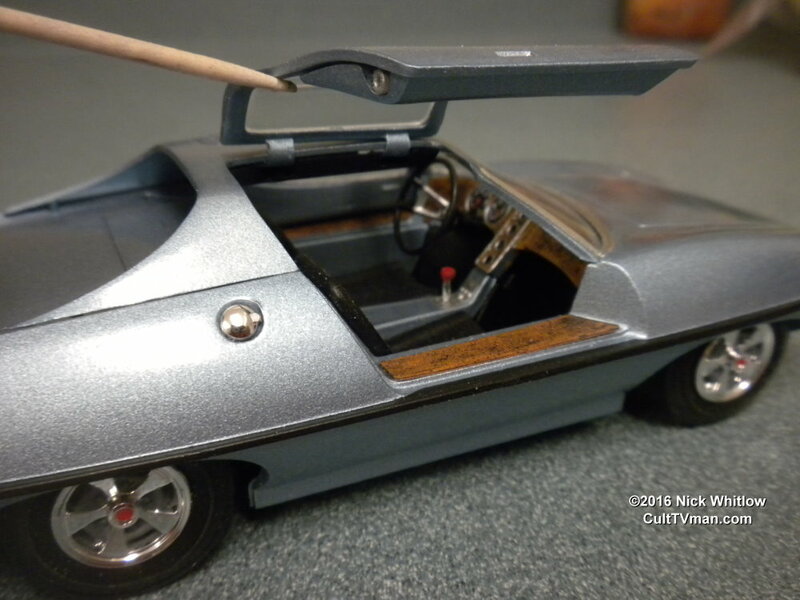 The steering wheel in the kit is modeled after the real 1965-66 Olds Toronado wheel used in the car originally. The horn button and ring form a bow tie shape and should be painted silver. The car was later converted to a smaller steering wheel with chrome spokes and a wooden rim. A similar wheel can also be obtained from the AMT Corvair kit. To simulate the woodgrain on the dash I painted it a light flat brown and then dry brushed flat black over that. Don’t mess with gluing in the four little gauges that are mounted above the gear shift. They are so small that you can just paint the holes black and dry brush the silver ring around each one. To add woodgrain to the door sills, I cut .010” sheet styrene to fit, painted them to match the dash, and glued them in place. It was a lot easier than trying to paint on the door sills. To add more detail to the rocket launchers in the door panels I cut pieces of a small diameter plastic tubing (sorry I don’t remember the size), painted them silver, and glued them to the opening on the back of the door panels. This gives the ends more of a launch-tube appearance. Trim them flush with the door panels or they will interfere with the closing of the doors. 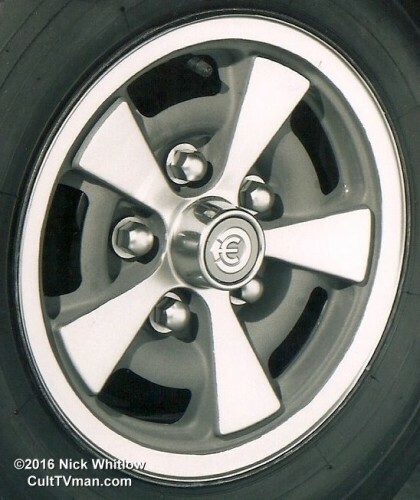 The chrome wheels covers (yes, they were actually Cycolac plastic wheel covers installed over stock Corvair 13” wheels) can be detailed with flat gray paint. See the photo below of the actual wheel covers. The Piranha kit includes an optional parachute that glues into the license plate area. The real car DID have a parachute, but it was located in a compartment BEHIND the license plate. Building a compartment and drop down license plate would be a great detail for your build.